Options Vet's Hot Spot Foam 4 oz. The newest club is a hot spot you can enjoy. When your dog has hot spots, you need to treat them quickly and effectively. Vet's Best Hot Spot Foam is a no-mess foam application you can apply directly to sore hot spots. The gentle, alcohol-free foam quickly calms and relieves hot spots. 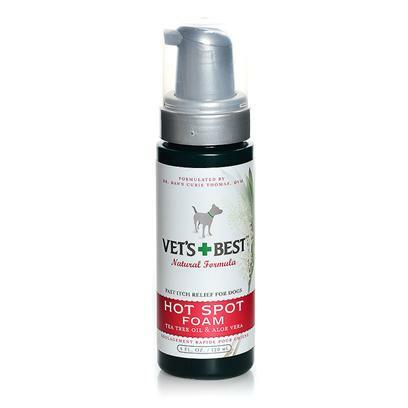 Vet's Best Hot Spot Foam also soothes red, raw, irritated skin. And it won't affect topical flea control. It's gentle enough to apply directly to the affected areas. Use the foam with Hot Spot Spray and Hot Spot Shampoo. Shake well. Thoroughly massage Hot Spot Foam throughout the haircoat, paying special attention to itchy areas. Gently apply foam to any sore spots. Avoid the eyes. Let dry and then brush non-irritated areas. Use up to four times a day or as needed.